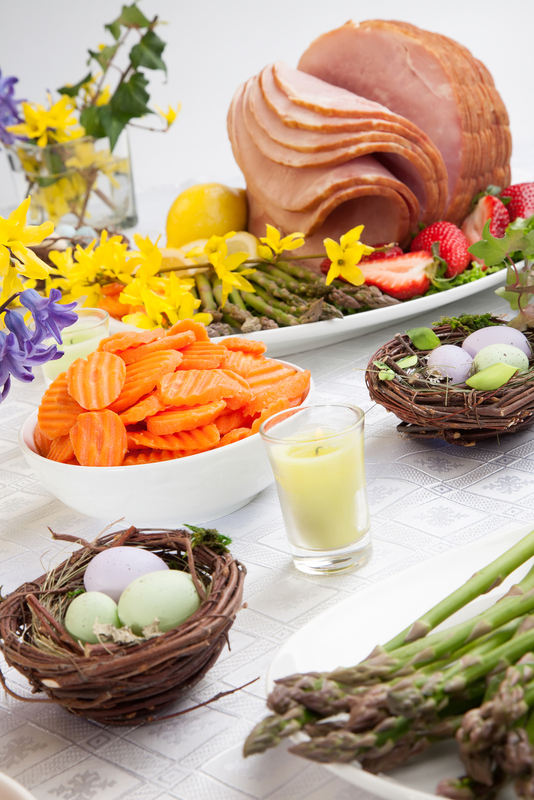 Rita H. asks: Why do we serve ham on Easter? Under Jewish dietary laws (called kashrut), eating pork in any form is strictly forbidden. Jesus Christ was Jewish. So why, on the anniversary of his resurrection, do people traditionally serve ham? You’ll often read it’s because ham is supposedly a “Christian” meat, able to be consumed by Christians but not certain other prominent religious groups. However, the real reason is simply because it’s in season. While modern food storage techniques and supermarkets with efficient and worldwide supply chains shield us from this fact somewhat, like fruits and vegetables, different meats also have seasons, and these depend on a variety of factors including what the animals were eating and when, where they were in their growth cycle, and the availability (or lack) of refrigeration. With pigs and cows, before refrigeration, it simply made sense to slaughter them in the fall. Since it takes a fair amount of time to butcher a beast as large as a hog or steer, the cold temperatures helped keep the meat from going bad before it could be properly prepared. The tradition of acorn-fed pork goes back millennia . . . . The oak nut was a diet staple because the pigs roamed and rooted about for acorns in the forests of Italy and Spain. An acorn diet is today best known as what makes the prized and pricey Jamón Ibérico of Spain so succulent. Butchered in the fall, most hams were prepared and allowed to properly cure over the winter to further develop their flavor. This was a particularly important food source this time of year in some parts of the world where the rest of the stored meat would have already been eaten, with little other meat of any real quality available. This was the case in North America where the other traditional spring meat, lamb, was (and still is) less in vogue, which is also why eating ham on Easter in North America is much more popular than other regions where Easter is celebrated. Conversely, in Europe, lamb is commonly served at Easter, and the tradition actually traces its origins to Jewish Passover feasts. This is also certainly fitting for Easter, with Jesus as the “lamb of God.” Born shortly before the holiday, young lamb may be slaughtered within 6 to 8 weeks, and thus offer a fresh, as opposed to cured, option for Easter protein when historically other such protein sources were scarce at this time of year. Eggs are popular at Easter, at least in part due to the fact that spring is the peak season for their production. As a result, eggs have been a part of spring celebrations since long before Easter was a thing; for example, decorated eggs have been a part of the Iranian New Year, Nowruz, (observed on the spring equinox) for millennia. In addition to the refrigeration factor, like pigs, cows are also thought to be tastier when slaughtered in the fall. This is due apparently to the fact that “the frost has killed flies and sweetened the grass [so the] cows are more comfortable.” Among other things, cows slaughtered when fatigued or in distress also negatively impacts the shelf life of the meat. Turkey is also tastiest in the fall because, as the weather cools and the days shorten, their hormone levels shift and they fatten up. On the other hand, since most chicken eggs are laid in the spring, those that are allowed to grow into chickens are traditionally slaughtered in the summer. Easter bunnies have their roots in old German pagan traditions celebrating the goddess Eostra, who was honored for bringing spring and fertility on the spring equinox. Because of their fecundity, rabbits were used as her symbol. Why do Christians eat ham and color eggs at Easter? Winter is Here – is Steak Season Over? This was such a fine, interesting, and well-written article that it was a terrible shame, Melissa, that you had to do it harm at the very end (in the final “bonus fact,” by two cases of sloppy choices of language. (1) You stated: “If you’re wondering why rabbits are considered such prolific breeders, it has less to do with them getting it on more than many other animals … .” Please work a bit harder to avoid using vulgar slang, keeping in mind that you are writing, in public, for a very wide readership (people of both sexes and of all ages). It would have been wiser (showing more maturity) to have to the rabbits “mating,” instead of “getting it on” (a phrase that is associated with immaturity and is offensive to many readers). (2) You stated: “… the [rabbit] babies are ready to make babies at the stage when most human offspring are still mostly just poop and drool factories … .” From my #1 comment, above, I’m sure that you can guess part of what is wrong with quotation #2. Although you were trying to generate a laugh (or at least a smil), a serious site on the Internet (as TIFO should be) is not a place for “toilet humor” (which is actually something that is inappropriate for a mature adult to be using anywhere at all). The quoted passage is bad for yet another reason: We are at a time in history when there is a serious anti-baby mentality in many places (with a lot of infanticide, battering, and other negative effects), and we ought to avoid making any negative comments whatsoever about babies, who are beautiful, innocent, helpless, and defenseless human beings, not “factories” of any kind. ” (or at least a smil)” You omitted the e in smile too. Can anyone else see this as a mischief? I am Australian with Angle, Celtic, Norman and Jewish roots and am more than 70 years old and never have I come across the idea that eating ham is Easter tradition. We have Easter in autumn, not spring as we have Christmas in high summer not winter. Might I suggest this useful and interesting website require the source of what is claimed to be information or fact identify what cultural tradition they are quoting or what hemisphere they are referencing? This is all tosh, as the traditional meat for Easter is lamb. As in the Bible. And some other books. Probably.